During the past week or so there have been some clear days of bright sun, as is usual in January. 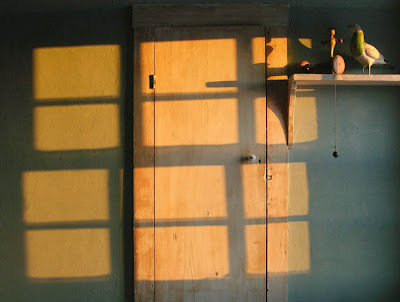 The sun is still streaming deep into rooms, as it rises each day higher in the sky. 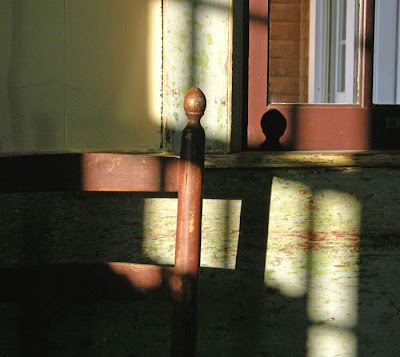 Morning light is especially dramatic: warm sunlight paints a grid on the bedroom wall, and highlights toys on a shelf; raking light repeats the shape of chair, and the color of chair and window enhances the rhythm. 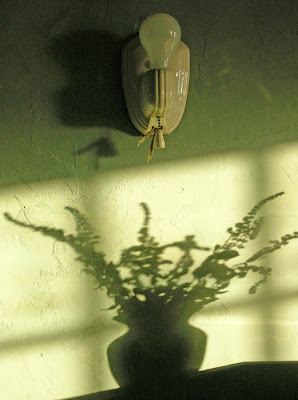 The cast image, a flat shadow, a trace of the original, widened yet so real (are we in doubt about its embodied form? ), has as much presence as the light. 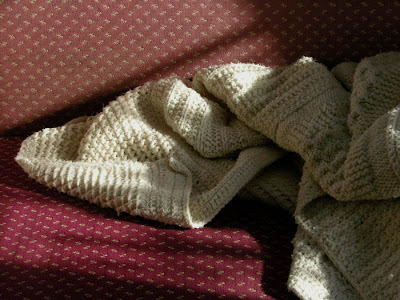 An afghan tossed across the couch catches highlights from the afternoon sun, its lovely textures winding around and back, across a landscape of stitches and wool. 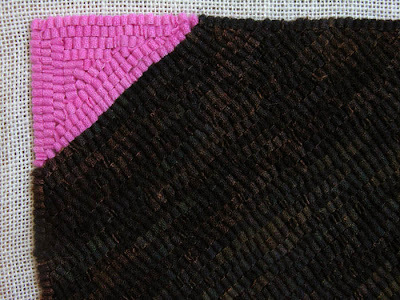 I started working on this ruglet from the triangle on the upper left, then continued into the broad black-ish shape. 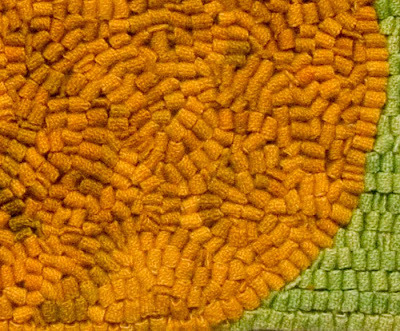 After the design is made, the wool dyed––and you can see that the black is quite varied in color, with browns and greens interspersed with the darker blacks––the next main decision is the direction of the hooking. I hooked the triangle in lines parallel to its edges, going around from the outside around and around until the shape was filled. This gives a feeling of solidity to the form, an illusion of the intense pink triangle being a thing. 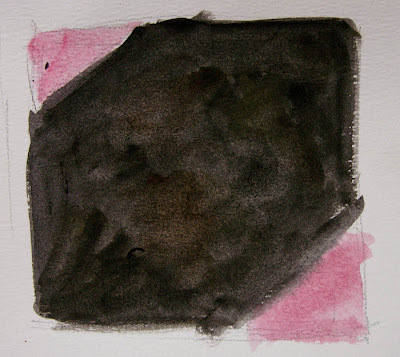 Contrasted with this closure are the open-ended lines of black, moving across the canvas. What I hope this will do, in the finished piece, is turn the leftover corners into forms that will balance the large mass of black, flipping positive space to negative, and back, not allowing spacial certainty. In 1937, Laslo Moholy-Nagy, an important member of the Bauhaus founded a school in Chicago which he called the New Bauhaus and would utilize the same educational model as the original. It soon became the School of Design and then the Institute of Design. The reason I am writing this post on the school is that it was a center of important and innovative photography during the middle years of the 20th century, much of which has influenced the way I use a camera to frame the world. The images in this post were taken from the terrific catalogue Taken by Design: Photographs from the Institute of Design, 1937-1971. 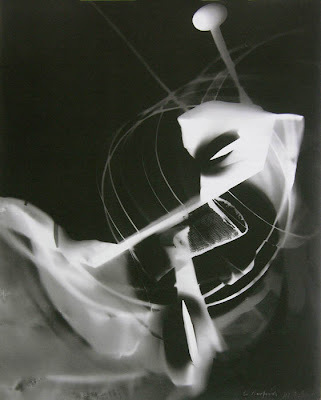 In Moholy-Nagy's photograms, light is the main actor, playing over objects brilliant or almost hidden, a poetry of shape and shadow achieved by the simplest means: things placed on light sensitive paper. It is this exploration of the abstract qualities of the photographic medium, rather than its storytelling capacity, that interests me. Callahan used stark contrast to alter his image from being a purely perceptual experience to a timeless one. 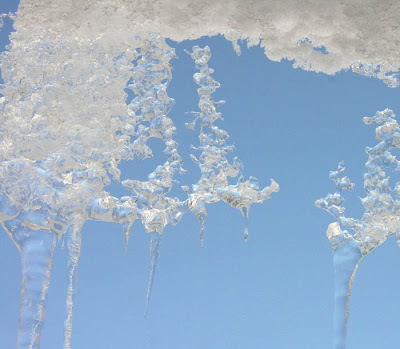 His photographs of nature, in their stark simplicity, become Nature, almost as a Platonic ideal. 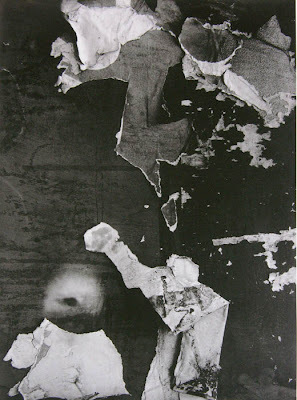 Walls, with torn papers and scrawled words and irregular surfaces, were a rich subject for Siskind, and seem an equivalent in photography for abstract expressionist painting, but here the artist is seeking and finding, in the actual physical world, a way of seeing that transforms the ordinarily overlooked, the scribbles and leftovers, into something surprising and beautiful. The corkscrew springs jostle against their serious straight neighbors in Levstik's image of lines in space. This fanciful "drawing" is light as the door is dense and solid, with broken geometry held together by a hasp. This photograph, one of the few in color in this catalogue, is one of my favorites. There's a strong emotional tug in that covered headlight, as though it was a blind eye, battered and bandaged. 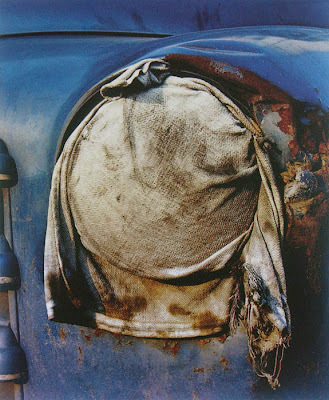 We are presented with a fact: the blue metal, shiny, rusted, with curves and details; the rag, stained and torn, a taut round with ends flopping; all so perfectly balanced as to make them new. Art Sinsabaugh's Midwest landscapes are different from the others in this post, in their sweep and distance (and I apologize for the poor quality of the reproductions; they are printed across a double page in the catalogue and I found it very hard to photograph them well, but please click on the image to see the enlargement). 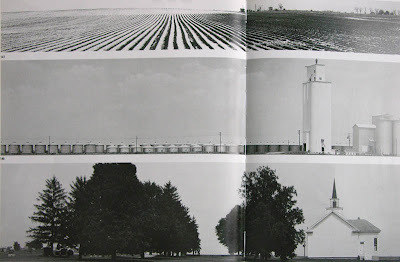 As a former landscape painter, I especially appreciate the brilliant use of the long format: the masses of dark trees as irregular punctuations alongside the white geometry of church and steeple; the long march of squat cylinders halted by the tall light elevator building; the endless crop rows moving from soft illegibility to clarity then back to the dark. 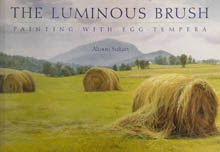 Portraits of a landscape, straightforward and clear, and as in all this work, the discovery of extraordinary beauty in commonplace things, a lesson in paying attention. The painting I've just begun, based on the gouache study above, is a bit larger than others I've done recently, at 14 x 22 inches. It also is more spacially complex; rather than an essentially flat vertical planar image, it moves in curves toward the picture plane, with a deep canyon between, and moves back in space along a flat surface broken by a green triangle. 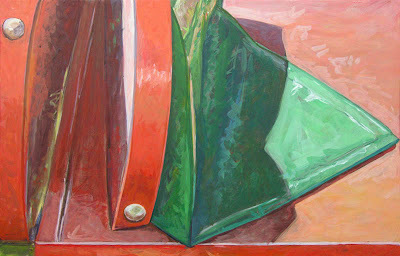 I'm of two minds about this complexity: I do like the composition, with the round and the flat, the red and its complement green, the hard metal and flexible tarp, the two bolts as shiny "eyes"; but I also feel myself yearning towards greater simplicity, as in my ruglets. I'll enjoy working on this painting, but will be thinking a great deal about where I am going. After yesterday's terrible rainstorm, which left much of the area around my house bare of snow, I expected the woods path to be have only a thin coating of snow, so left my snowshoes behind for my midday walk. Instead, my boots sank into the few inches of gravelly snow, making progress slow. Before turning around for home, I found a jeweled treasure on the ground: branches blown down by the wind, dotted with brilliant orange lichens, which I don't think I've seen before. 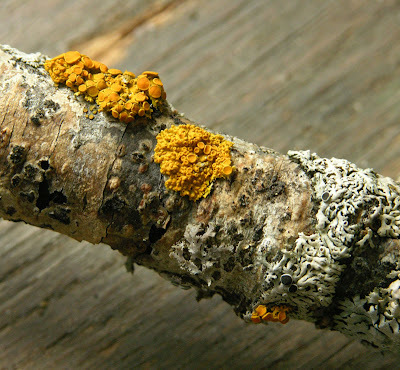 There was even a tiny bit of a red lichen, which you can see below. I brought a few branches home to photograph; the ones above are about 5/8 inch in diameter and the two below are 1 inch, to give some sense of scale. It wasn't until I had taken the photos and then enlarged them that I was able to see the wonderful shapes and complex little worlds that these lichens inhabit. The grayish green lichens turned out to have little black toadstool shapes (fruiting bodies perhaps?) 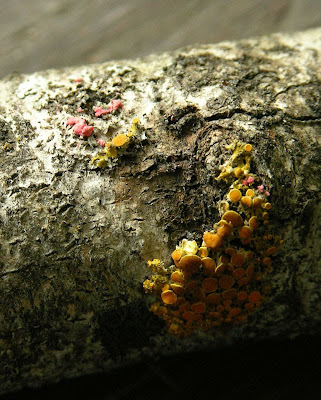 The orange lichens have little cup shapes; from the internet I've found that their common name is Pincushion Orange Lichen, a lovely phrase. 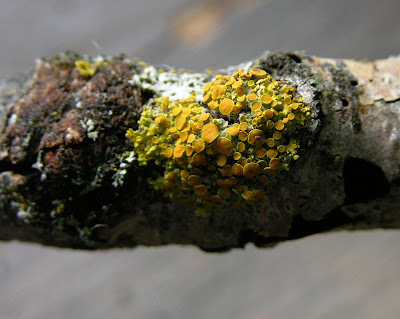 I don't know why I find these small living forms – mosses, along with lichens – so compelling. Perhaps because they are almost hidden, usually overlooked, and need special attention to enjoy them. Please click on the images to see enlargements so you can enjoy these tiny landscapes more fully. There are many versions of this classic soup, some are cold for summer eating, but here is a recipe for warmth on winter days. It is adapted from a recipe by my friend Harriet Shorr, who titled it "Mercer Street Borscht". She uses soup bones in order to make a hearty stock, which you can do if you would like, but I find it perfectly delicious as a vegetarian recipe, using many of the fall crops stored in the cellar. 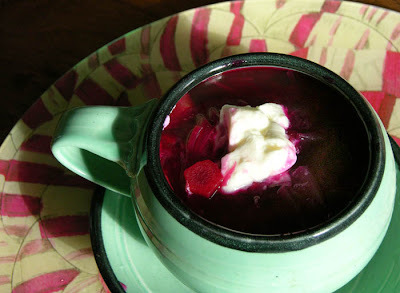 I love the color of this soup, its vivid cherry red turning to deep pink as you swirl the yogurt through the broth. Put the vegetables with the water in a large pot, bring to the boil and cook, partly covered, till they are quite soft, 40 minutes or so, adding salt and pepper to taste. Add lemon juice and herbs, and garlic if you wish. Serve hot with yogurt or sour cream. With this new project, I am back to straight line geometry after the organic curves of Roundabout and the geometric curves of Swing. 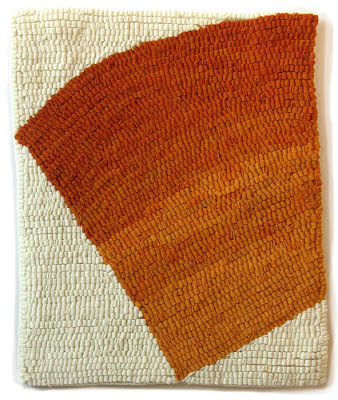 This 12 inch square has lopped off corners, a design that could come from Ellsworth Kelly. 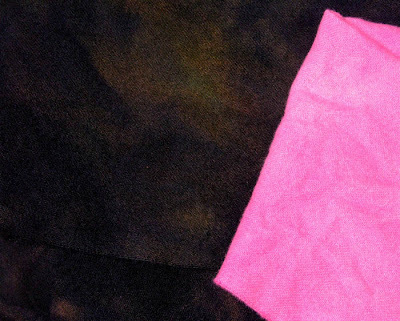 The slightly wacky color – somber blacks with hot pink – is inspired by the work of Mary Heilman. I've admired her exuberant, off kilter abstraction for many years; last winter the New Museum of Contemporary Art in NYC mounted a exciting retrospective called "Mary Heilman: To Be Someone". 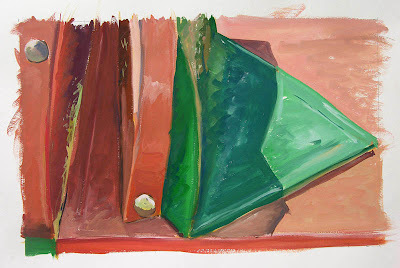 Her paintings have a fresh, direct energy that makes simple geometries playful and personal. 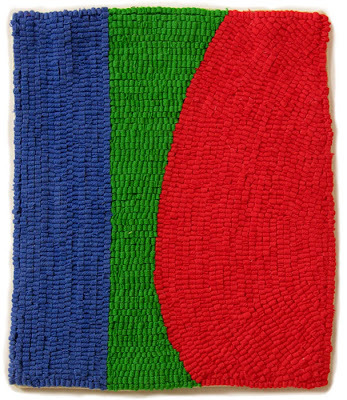 I would place her in my little category of "funky minimalism", along with Richard Tuttle. 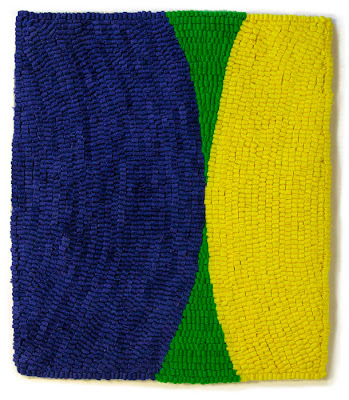 There's a similar sense of freedom from restraint, yet working with basics, in both artists. 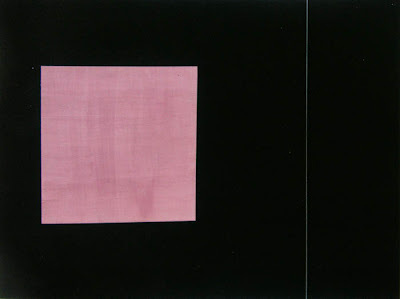 I love Heilman's use of unconventional color, especially pink, which appears in many of her paintings, sometimes paired with black. She's given us, in Guitar, a sassy feminist ("I enjoy being a girl"?) take on the high-art seriousness of abstraction. 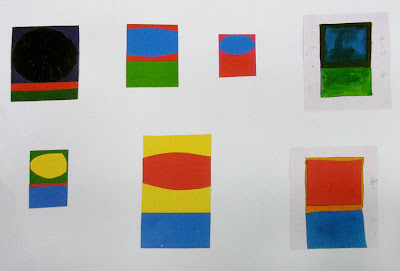 She has an inventive way of using multiple panels to make an image, as in Chartreuse. In all her work, a sure and juicy brush paints emotional life into geometry. Today has been one of the rare perfect winter days, with a clear sky of a blue not seen in summer; with red undertones, it is more a warm ultramarine than a cooler cobalt. Looking up at birch trees against the sky, I saw the trees take on an almost yellowish tinge against the strong deep blue, startling in its intensity. The light played with the sculpted surfaces of ice, which showed a range of bright warm tones in front of their blue backdrop and seemed to float and dance in the air. Blue also streaked across the snow in broad and fine shadows, making clear the artist's claim that cast shadows are cool in color. 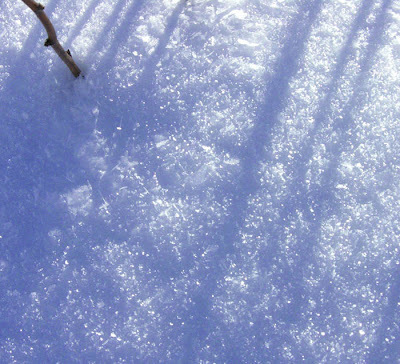 The snow sparkled as the light glanced across crystals looking like delicate shavings of ice; the pinpoints of light shone in shadow and in light. Today was a day for which photography is inadequate, at least for me, though I certainly tried to capture it. Perhaps inadequate words and inadequate images together will give you a sense of the day. The diptych Fasteners is finished. I'm pleased with its geometries and color. One thing I changed from the study is the color and value of the fasteners; in the study they were a darker, redder color but I felt that the contrast of a lighter shape floating above the darker colors beneath worked better. The lighter colored rectangles draw our eye back and forth between panels, heightening our awareness of the movement of shape and light. A commonplace book is, according to Wikipedia, a compilation of knowledge gathered into a book. 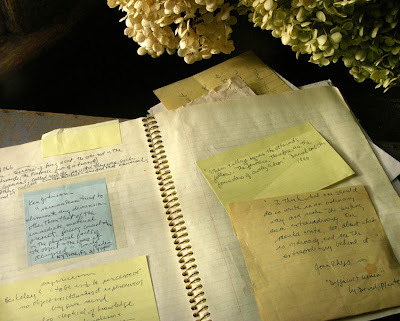 When I moved to Vermont in 1994, I began to collect quotes that I found interesting, along with notes on my non-fiction reading, in a pale yellow papered notebook. I wrote some notes on bits of paper that I had at hand at the time, others I copied directly into the book. I soon became less rigorous in my notetaking and abandoned the book. "When tillage begins, the other arts follow. The farmers, therefore, are the founders of civilization" Daniel Webster, 1840. "I think what one should do is write in an ordinary way and make the writing seem extraordinary. One should write, too, about what is ordinary, and see the extraordinary behind it." Jean Rhys, in Difficult Women by David Plante. "Pavements, holes, trenches, mounds, heaps, paths, ditches, roads, terraces, etc, all have an aesthetic potential." 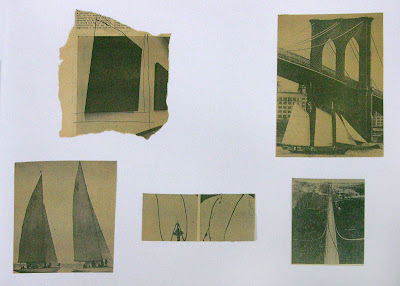 Robert Smithson, from his article "The Monuments of Passaic", Artforum, December 1967. "...the world is neither significant nor absurd. It 'is', quite simply. That, in any case, is the most remarkable thing about it." 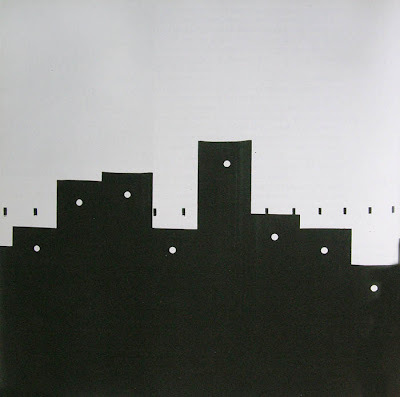 Robbe-Grillet, For a New Novel, 1963. "You must find your own quiet center of life and write from that." Sarah Orne Jewett, in a letter to Willa Cather, quoted in Willa Cather: a Critical Biography, by E.K. Brown. "...after seventy, when you have lived out your life, you begin another." from Margaret Oliphant's novel Hester. 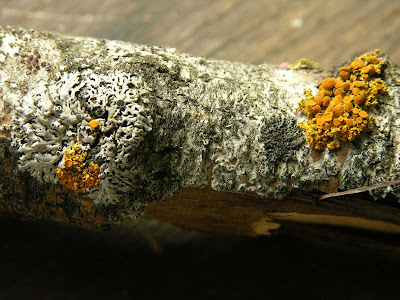 When I bring firewood into the house during winter, I often notice that different forms of lichens and mosses are attached to the wood. They seem very alive, as though they'd be ready to get growing again if they were back in the woods. It turns out that mosses can go for many months without water, suspending their growth while in drought. I learned about this ability while reading Gathering Moss: A Natural and Cultural History of Mosses by Robin Wall Kimmerer, a wonderfully informative and fascinating look at the tiny, beautiful plants. Her writing combines scientific details imparted with a great teacher's ability to make them understandable, and poetic musings on nature. So, I thought, I'll pick off some of the moss from the log and place it in the rosemary flowerpot, which already had some moss growing in it, though a different species; it'll be happy to be watered again, I thought. The photo above was taken a couple of days after the move. But....I hadn't yet read the chapter detailing the difficulty of transplanting mosses; they are not at all like perennials, which you can move around the garden at will. 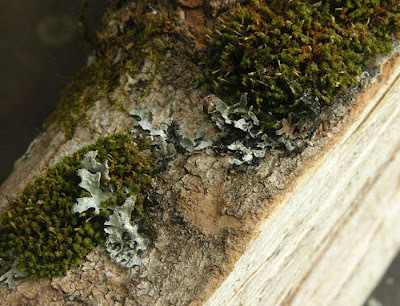 Each species has a particular habitat and growth pattern; this moss which was happy far above the ground growing on bark, turned out not to like the environment of the flower pot. The lovely little moss is now brown, alongside the soft green carpet of the happy moss. 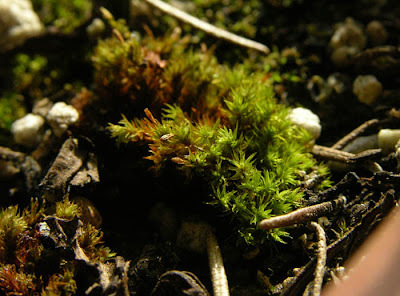 I've learned that a moss is a plant to appreciate where it appears and grows, and that it is not one to be domesticated. 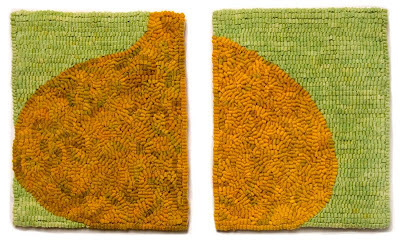 Here is the completed diptych Roundabout, which began with sketches inspired by vases and pots I had seen at the Metropolitan Museum of Art, and seems to have ended with amusing, organic forms bulging with––I hope––life. 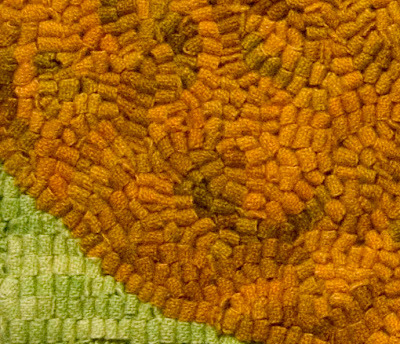 You can get a better sense of the color variations in the wool looking at the details below. I see winter as a respite from the garden, a brief interval between the cleaning of flower borders, final gathering of crops, and the starting of seeds for the new season. I love having a few months--and it is a very few, between mid November and early February, when I start onion seeds––without a garden chore. 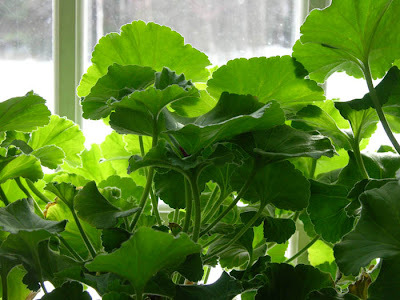 So, the only plants I have indoors during winter are the two large pots in the two south facing living room windows, one with a rosemary plant, the other a geranium. Both come in from the summer porch when frosts threaten and go out again in spring. 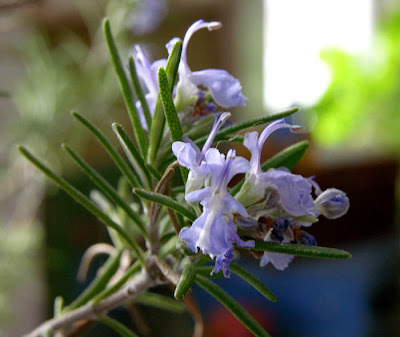 They are harbingers of longer days: the rosemary is flowering and the geranium will begin showing its deep red blossoms as the day length increases. 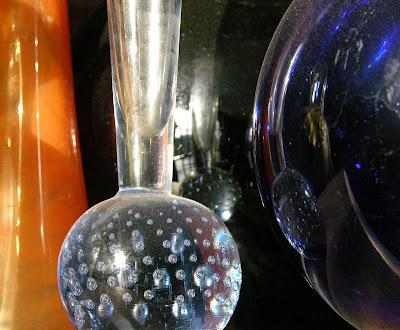 This morning as I was sitting at the table eating my breakfast, I looked up and saw sunlight brightening a group of glass vases huddled on a shelf of the antique hutch. The light bounced in spots and lines, heightening reflections and creating little surprises of color, making the objects shimmery and alive. 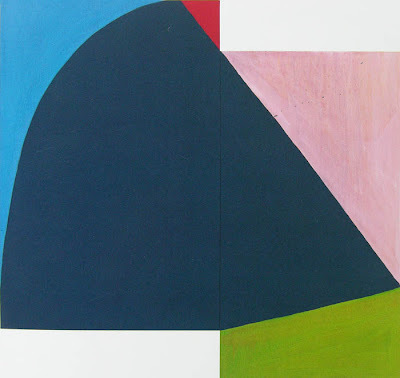 A few days ago I began a new painting, a diptych. The subject, curved rectangles of steel held onto the surface by large bolts, rise in a shallow space above the surface plates they are holding together. There are times when I'm standing in front of a motif, figuring out how to compose a picture, that I feel a dialogue between two images would be most interesting; in this case, the image on the left can stand on its own, but I think it has added resonance with the theme and variation of a second panel. The machine in this painting is the same one in the painting Opposing Angles (dare I tell you that it is a manure spreader?). This painting will be about texture, among other things; I wrote a post on texture which you can see here. 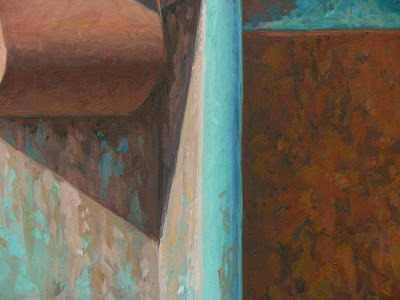 As I've worked on the painting, the red-brown rust has seemed to me like islands in a Caribbean sea. These are the black and white photographs that I use as studies for the detail in the paintings. 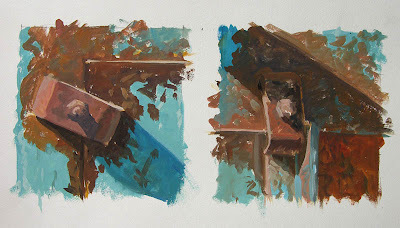 They are shot at the same time as I'm working on the color study, although you can see differences in the light; I worked on the study in early morning and the light changes quickly then. When I started working on the underdrawing, I found that I didn't like the balance of the diptych when the fastener on the right was closer to the left panel; I had originally wanted a square on the lower right, but then thought it didn't work. So I moved the shape over to the right. When I added color, it looked to me as though the fastener was a little too far over, so I moved it back a bit towards the left; now it looks balanced with the left panel. 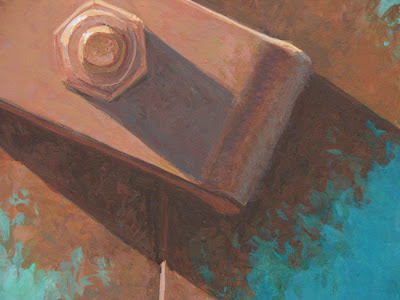 The other compositional issue I had to resolve was which shadow I would use on the fastener, the diagonal or the horizontal; I decided that having more light on the object was a better solution. I like the strong right angles with the strong diagonals of shadow and the more subtle ones of fasteners. A note about color: I found that a light tint of phthalo green is very opaque and brilliant and close to a the blue I wanted. I added just a bit of cobalt blue cerulean to the green and got a perfect color. You see here the beginning layers of paint, with many more to come before the painting is done. 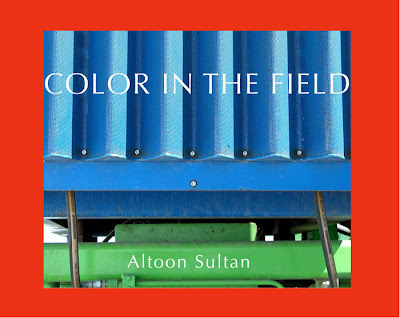 To see a small preview or purchase book click here. It's now very easy to self publish a book with print on demand technology; using InDesign, I did a page layout with the photos, then made a PDF which I uploaded to lulu.com. The cover was made separately in Photoshop. Then I waited for 10 days after ordering a book, which came yesterday. What a treat! it came out looking very good, which was a bit of a surprise to me. There's something wonderful about holding a book in the hand; an image inside it has more visual weight than when it is online. I love the digital universe and love blogging, but it is a different form from a book, just as a book is different from a magazine. There is immediacy in blogging; you write a post, then another, and as you write new posts previous ones recede in time and in memory. A book approaches timelessness, and a pile of books on a shelf is a gathered treasure. 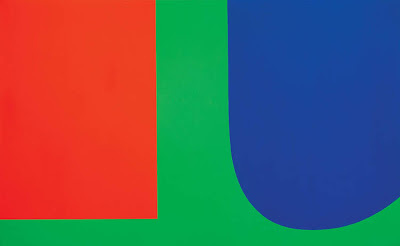 The paintings and drawings of Ellsworth Kelly have given me, in recent years, a deep sense of visual and emotional satisfaction; the drawings, with their immediacy and freshness, are especially engaging. Shape and color are simple, but it is a simplicity that comes from understanding what is essential by looking at the world and distilling its essence. Each shape seems the ideal of its kind, a Platonic form. 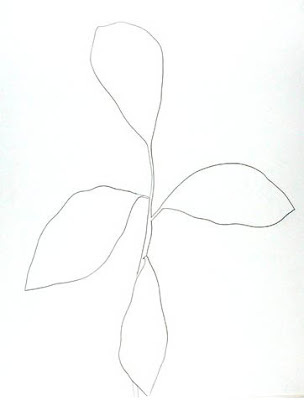 Kelly did many line drawings of plants, recording them with grace and sensitivity. 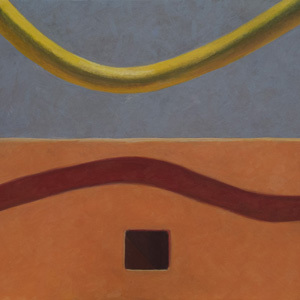 The elegant quality of line reappears in the curves of his paintings. The first time I saw some of Kelly's photographs was at the Guggenheim museum a number of years ago. It was an ah-hah moment: his shapes came from sources other than his plant drawings or his imagination. 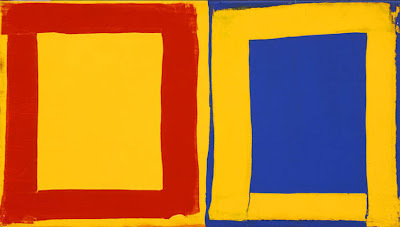 It was fascinating to see the process of his eye seizing on shapes in the world and transforming them into his art. 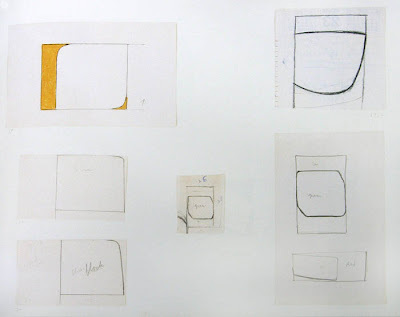 In 2002, the Drawing Center in NYC mounted a show of Kelly's working drawings, titled Ellsworth Kelly, Tablet: 1949-1973. It consisted of found photographs, sketches on odd bits of paper and color studies, all showing his mind at work. The images above and the pencil and color sketches below are from the catalog from the show, a wonderful publication of over 200 pages of drawings. Here and there are surprises, like the photo from a magazine of the front of a wing tipped shoe (p 170), whose shape you see repeated in drawings, or a flattened cone-shaped dixie cup (p 34). It's all a visual delight. Kelly has been an artist I have looked to again and again for inspiration for my textiles, as the three pieces below. Now, with the large catalog of working drawings, I will look to him still.